With the Tournament of Champions starting today, it’s a good time to take a look at a rare scenario: a wager-to-tie situation when there can be only one winner. It happened most recently in the 2014 Teen Tournament Finals, where both Alan Koolik and Jeff Xie were, in effect, tied going into Final Jeopardy!. Both properly wagered everything, and Jeff took the title on a tiebreaker clue. So far, seven tournament games have gone to a tiebreaker; this example was one of two I consider to be warranted, because both players made the correct wager. 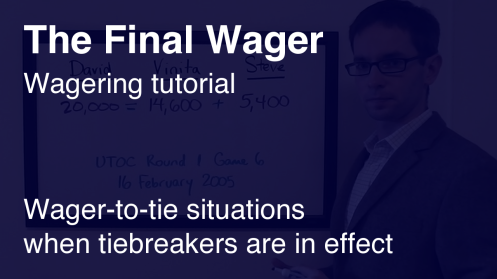 In Part Two and Part Four of my wagering tutorial, I lay out several situations in which the leader is best off withholding the dollar, because there’s an increased chance the extra dollar will come back to haunt him. In a tournament, however, there can be no ties. In a situation like this, then, how do you decide what to do? Allow me to suggest four considerations. When you are tied with an opponent, you have just two choices: everything or nothing. Were it just Karan and Sarah, they could each pick their preferred option and hope for the best. 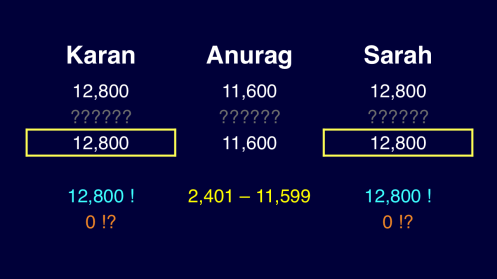 Anurag throws a wrench into this, however: he can cover that zero wager, so both players are forced to wager everything against each other. Here again, two players are tied for the lead heading into Final. The third-place player, however, can’t pass them if either makes a wager of zero. So now we look at the category, and ask: do I like it? Does my opponent like it? What does my opponent think about this, and how will he wager as a result? The mind games quickly spiral out of control. Most players will prefer to bet on themselves, I figure. 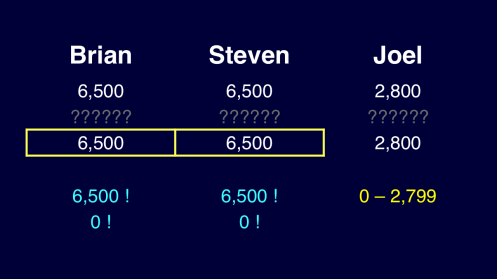 The Watson team found a correlation of around 20% of correct/incorrect Final Jeopardy! responses, which means if you’re on the fence between two wagers, you err toward assuming your opponent(s) will have the same outcome as you. In this situation – first equals second plus third – Steve, in third, is forced to wager everything, while David and Vinita each have a few options. Let’s look at what Vinita can wager, and how David might want to respond. 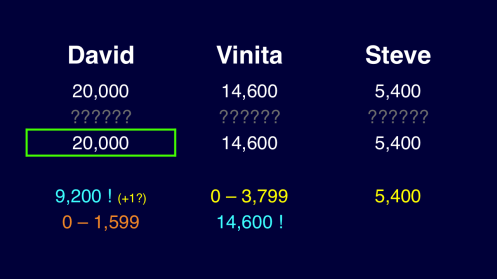 If Vinita sticks with her low range, David can win with a small wager regardless of whether anyone responds correctly. If David thinks she’ll go for everything, however, he should add the dollar to his lockout wager. If he’s right, Vinita will more likely also be correct than incorrect, so he’ll avoid the tiebreaker; if he’s wrong, Steve will more likely also miss than hit, reducing the benefit of the tie wager. I don’t discuss this final example in the video due to time considerations, but let’s go through it anyway. 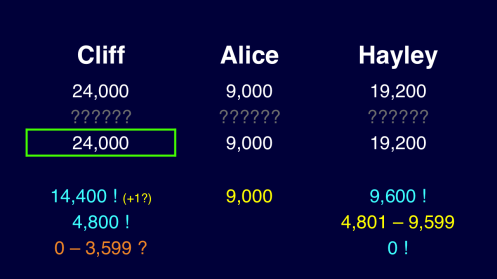 Hayley, in second, has exactly 4/5 of Cliff’s score – not one of the wager-to-tie situations I recommend you keep in mind, but still sitting exactly on a break point. For one, Alice needs to respond correctly to have a shot, so it’s all in or bust for her. To cover Cliff’s “unsafe” (or “Colbyesque”) 4,799 wager, Hayley could wager 9,600, which is exactly her maximum to stay safely above Cliff should they both miss. Both players – should they recognize this situation – can take the previous suggestions into account, as well as their assessments of their chances of winning on a tiebreaker. Maybe you like your odds, and will take the risk of a tiebreaker in return for a safety net on the downside. If you’ve been outmatched on the buzzer or in general trivia throughout the course of the game, however, perhaps you go for the outright win now – much like how football teams sometimes go for a two-point conversion at the end of the game when an extra point will send the game to overtime. Nobody said this was easy! 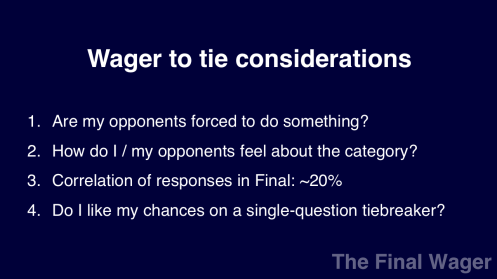 Another factor, which I mentioned in an email to you a few months ago, is the number of outcomes where the decision to tie vs. not to tie becomes a factor. Using the A=B+C example, there are two outcomes where adding the dollar is better (RRR and RRW) but only one where going for the tie is better (WWR). In a lock-tie game it’s a draw when considering the number of outcomes alone (the outright win is better with RR and the tie is favored with WR), but the correlation factor probably makes adding the dollar the better route. Like you said in a tied-going-into-Final scenario you really have no choice – either bet all or nothing (depending on the other factors) and hope that if it comes you prevail on the tiebreaker, since betting another amount would likely hurt you more than it would help. I guess this whole thing applies to regular games now. Revolutionary change!